Laser produced plasma based nickel-like transient collisonally excited (TCE) x-ray lasers use the highly ionized hot plasma as the laser medium to generate gain in the x-ray regime. The creation of the target plasma and its ionisation up to the Ni-like state is done by electron-ion collisions induced by a short laser pulse. 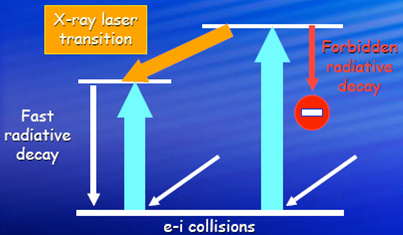 Then the population inversion for the lasing transition is produced by electron-electron collision induced by another short laser pulse. 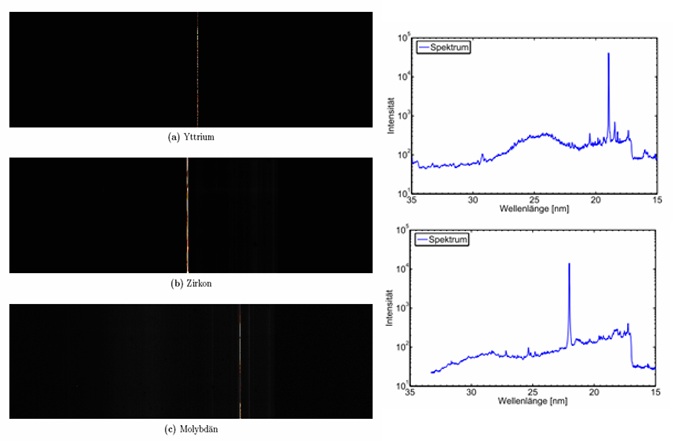 The double-pulse non-normal incidence pumping geometry is the scheme to generate x-ray lasers in a very reliable and stable way at high output power. The stretched oscillator pulse is injected into a Mach-Zehnder unit to create an optimized double-pulse, which is then amplified and compressed revealing its final temporal shape. This double CPA laser pulse is sent into the target chamber and focused by spherical mirror to a line focus on the target material to generate the x-ray laser emission. Additionally high order harmonics are produced by a short pulse laser focus in a gas tube to seed the x-ray laser amplifier. Double-pulse generation with the Mach-Zehnder unit and the chirped pulse amplification and the compression in the laser system. 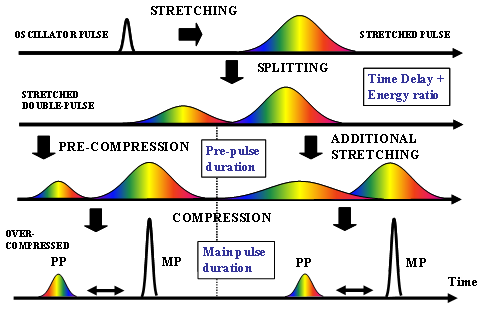 Grazing incidence pumping (GRIP) of the main pulse to optimize the energy deposition in the pre-plasma. Traveling-wave excitation along the line focus to match the transient gain of the x-ray amplifier. The spectra of x-ray lasers and high order harmonics reach from the extreme ultra violet EUV (100nm – 10nm) down to the soft x-ray regime (10nm – 1nm). The Ni-like yttrium laser at 24nm (51eV), the Ni-like zirconium laser at 22nm (56eV), the Ni-like molybdenum at 18.9nm (65eV), the Ni-like palladium laser at 14.7nm (84eV), and the Ni-like silver laser at 13.9nm (89eV) represent lasers in the EUV. 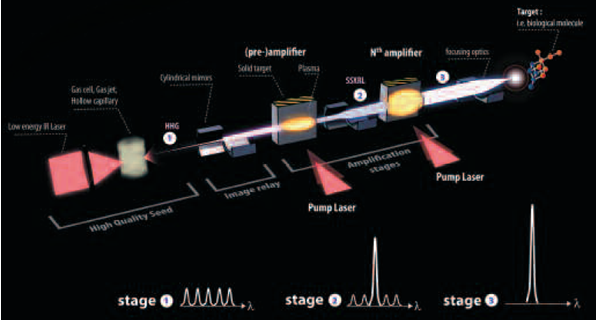 The Ni-like samarium laser at 7.3nm (168eV) is operating in the soft x-ray regime. High order harmonics in argon cover the EUV down to 19nm (65eV). The coherent ultra short high order harmonic soft x-ray source is sent into x-ray amplifiers and is then focused onto the target (i.e. biological molecules).